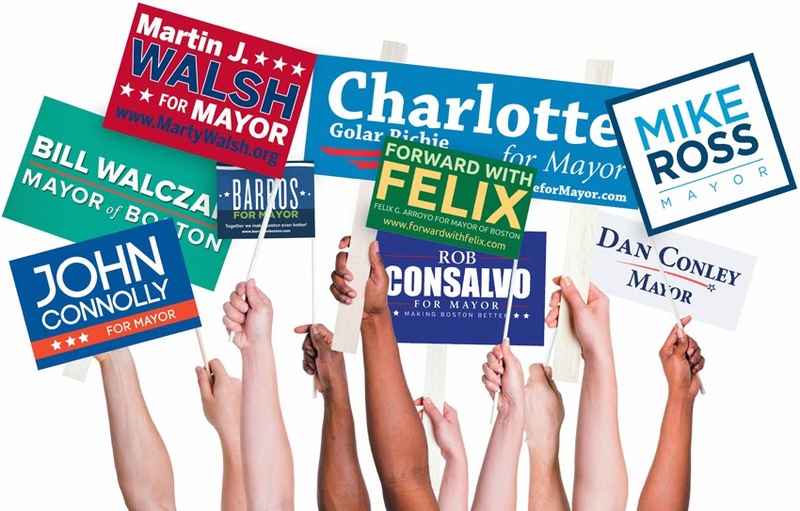 Who will be the next mayor of Boston city? It’s been a long, hot summer in Boston. That hasn’t stopped 12 mayoral candidates from crisscrossing the city and blanketing the radio and television airwaves as they seek to replace retiring Mayor Tom Menino, who’s been in office since 1993. Moreover, this campaign has been notable for the candidates’ extensive use of the internet and of social media, in particular, to spread the word of their candidacies and of their daily activities. On Tuesday, the 24th, Boston voters will go to the polls to choose two finalists who will battle it out until the final election on Tuesday, November 5th. At the beginning of the summer, I wrote about the then fledgling campaign and assessed the viability of the candidates. Fortunately for me, and despite my having been away for a number of years and the city of my birth having undergone extraordinary changes in recent times, my political calculus hasn’t proven too far wrong. But there have been a few surprises. First is that the candidate who would be Boston’s first African American and female mayor, the former Massachusetts state representative and city and state official, Charlotte Golar Richie, hasn’t been able to raise a lot of money to fuel her bid. My suspicion had been that national money from African American individuals and groups and from advocates for women’s involvement in politics would pour in. There’s been some, but not what I expected. Furthermore, I would have bet serious money back in early June that the city’s newspaper of record, the Boston Globe, would have enthusiastically endorsed her candidacy. The paper did not, however – and the rumor is that she performed poorly when interviewed by the Globe’s editorial board. The Globe gave one of its two endorsements to another candidate of color, John Barros, the son of Cape Verdean immigrants to Boston. The vote of confidence seems to have resulted from the fact that he has demonstrated a real leadership capacity and articulated a bold new view for the city from the outset of the campaign. As he was a high school classmate of mine, I probably shouldn’t be surprised by his robust candidacy, yet people I’ve spoken to there who are firmly in different camps are nonetheless universally impressed by him. I still think he set the bar too high in his very first run at elective office and will finish somewhere in the “back middle” of the pack, but I’m fairly certain that this isn’t the last Boston voters will hear from John Barros. The third is that, at least according to the polls, not one of the three candidates who I believed could be a wild card and a major factor in the race has emerged. Felix Arroyo, an at large Boston City Councillor and proven vote getter throughout the city, remains mired in the single digits. Likewise, Rob Consalvo, an Italian American who represents the same city council district as Mayor Menino once did, where he is extremely popular, and who presents rather similarly as an “urban mechanic,” hasn’t caught fire and is stuck in the second tier of candidates. At the beginning of the summer, I also believed that another Boston City Councillor, Mike Ross, could become the candidate of “new Boston” (i.e., those thousands of Bostonians, typically young professionals, who have moved into the city in recent years as longtime residents have moved out) and surprise people. If one believes the polls, this hasn’t happened. Of course, the polls do show that the candidates are fairly closely bunched and that there remains a significant block of undecided voters. Additionally, anecdotal evidence abounds that some voters who have pledged support for a candidate remain privately open to changing their minds. What’s more, the voting patterns and rates of participation of newcomers to the city remain virtual unknowns. This renders speaking in absolutisms or writing candidates off a tricky business. It would seem, however, that a top tier of candidates has formed, and that those outside it have a mountain that is perhaps to large to climb to become one of the two finalists that voters will choose on Tuesday. That top tier consists of Golar Richie, Suffolk County District Attorney Dan Conley, Massachusetts state representative Martin Walsh (who has been endorsed by the Irish Voice) and at large Boston City Councillor John Connolly. A constant in the polls is that Connolly is out in front and is the choice of approximately 16% of the vote. He was the other candidate to receive a Boston Globe endorsement. He announced his mayoral candidacy even before Mayor Menino decided he wouldn’t seek an unprecedented sixth term in office. Connolly has stressed the importance of education and draws support from similarly concerned parents throughout the city. He is popular with longtime residents and newcomers alike. Most observers expect that he will progress to the final election. A consistent trend in the polls is that Golar Richie and Conley are the outliers in the top tier; they’re polling between 8% and 12%. To make the final, Golar Richie will be depending on a large turnout of African Americans and on women voters to seize the opportunity to select the first female mayor. Conley, the most well-funded candidate, will be hoping that his track record as a prosecutor and hard line on crime, as well as his many television ads, will sway voters to his side. Walsh, whose standing at 12% has remained almost unchanged from the first poll to the most recent, will be depending on his huge cadre of 1,500+ campaign volunteers and unmatched ground game to get out the vote on Tuesday. He has a very effective new television ad that speaks not only to his base of long time Boston residents – in Dorchester and South Boston and throughout the city – and union and blue collar workers, but also to voters of colour. If I had to bet on the outcome, I would say that John Connolly and Martin Walsh will be the two candidates selected by voters on Tuesday to contest the final election on November 5th. Yet there are many variables at work in a very different Boston. Two things I can say for certain. First is that all the candidates deserve a lot of credit for articulating their visions, for working so hard to engage residents of a city they clearly love and for breathing new life into Boston politics. Regardless of the outcome, I hope none of them go away. Second is that I have a very long night ahead here in Galway – one eye on Boston news websites, one eye on Twitter, one ear on the phone – on Tuesday. I look forward to it with bated breath.